As I begin to establish roots here in Blacksburg and define this cozy town as "my home," the partition of the town and university becomes increasingly more evident. The Blacksburg Classic is a phenomenal example of this division. A stand alone race not associated with the university in any way, aside from supplying some of the participants, the Blacksburg Classic marked its 28th running this year. An interesting side note is that the first running in 1986 was called the Foxridge Classic and was held during a snowstorm; replacing a valentines day 10 miler. The race is organized by the Blacksburg Striders, a local running club, and directed by James Demarco of RunAbout Sports. The Classic is a showcase of the regions athletic depth and is a prime example of Blacksburg lifestyle. Having "lived" in Blacksburg for 6 years, prior to this past weekend, I had never run the Classic and wasn't even really aware of its' existence during my undergraduate tenure. Hence, another gem Blacksburg has to offer its' residents and "somewhat" of a well kept secret from the university population. Fitness wise, my focus this winter has been building for the Rock 'n' Roll Marathon in the middle of March and consequently most of my miles have been long and slow; primarily to develop endurance. Aside from the Lynchburg 10 Miler last September, I had never raced the ten mile distance or really even considered it as a "race distance" but after these two races I find that I really enjoy the length and intensity. Unlike most races that are held in the morning, the Blacksburg Classic starts at 1PM in the afternoon. I have to say I am not a fan of afternoon races, primarily because it messes with my eating schedule. Michelle and I have recently coined the term 'hangry' - a feeling of displeasure or hostility that results from a sense of hunger; I have determined that afternoon races make me hangry and that's bad news for all involved parties. Around ten, after a boring and mediocre breakfast (hence the hanger?!? ), I headed down to packet pickup at the local elementary school which was also the start and finish of the race. This was quite possibly the quickest packet pickup I have ever done, including the drive to and from the school I think I was gone from the house for a total of 20 minutes. I sat around for another couple hours before getting ready just after noon. Another huge advantage of running a local race is that I didn't have to leave the house for the race while it was still dark or in the wee-hours of the morning, or wait around at a freezing cold start line for multiple hours, instead I left for the race 30 minutes prior to the start. After a short walk from the Kroger down the street, the parking was full near the race, I said goodbye to Michelle and went out for a quick ~10min "warm-up," but really it was so darn cold that it would have taken a half hour to be actually warm. A few minutes after one a giant mob came walking down the street, as the start of the race wasn't at the school but instead a few hundred yards down the road, I had already snagged my spot at the start somewhere in the first quarter or so of the soon-to-be mass. The Blacksburg Classic is comprised of two distances, a 10 mile and 5K, which share courses and unfortunately a mass start. For the distances being SO different, a wave start or at a minimum a 5 minute buffer between races would really benefit runners of both distances. I also understand that it is a local race to help benefit the Blacksburg High School track team raise money for a rubber track (the current track is asphalt) and hence just thought of the idea of a wave start as I was writing this; the start did not detract from my race but could for someone going for a PR. Everyone waiting for 1PM to roll around. The mass walking to the start. My spot somewhere in the first 1/4 of the mass. The little kid on my right, Miles?! ?, decided he wanted to be on the start line and run with the big boys! He held his own pretty well especially with all of the 5k'ers on the front! Something you wouldn't see at a bigger race. The folks in shorts were much braver than me. I didn't really know what I was capable of when the race began and didn't really have a way to gauge how my body was feeling, although looking back I think the afternoon start had something to do with feeling lethargic. I wound up going out too fast, around 7 min pace, and quickly began the discussion with myself of whether or not I wanted to be running at the time. In my experience this is never a good feeling, especially when its occurring 2.5 miles into a 10 mile race. The 10 mile course was set up in a way that you made two loops through downtown Blacksburg (miles 1-4) and then completed an out and back on the Huckleberry Trail (miles 5-9) before finishing at the elementary school. The Huckleberry Trail is an undulating 6 mile rail-to-trail path between Blacksburg and Chirstiansburg, the neighboring town. Just prior to the three mile marker the race loops back toward town and splits with the 5k folks going right to the finish and the 10 miler's going left to begin their second loop through town. 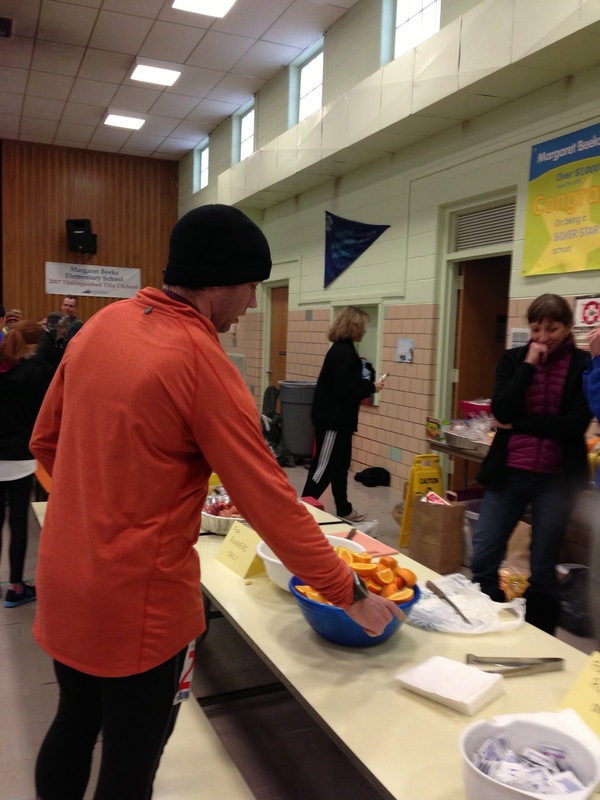 It took a lot of will power for me to go left as the elementary school was in spitting distance and with it post race food and warmth. Against my better judgement I went left and suffered through the next 7 or so miles. As I mentioned earlier, it was so cold out that it would take about 30 minutes of moving around to actually warm-up, well right around 3.5 miles I decided that I had enough of wearing the black gloves in my left hand below. Conveniently, I was near the beginning of the out-and-back section on Huckleberry Trail and was able to drop them off with the volunteers. Somewhere around the 3.5 mile mark. The rest of the race was a continuous mental battle. I had to set goals to prevent myself from walking by telling myself to just make it around the corner ahead and then to the next mile post. Once I crossed over Tech Center Dr. (the road by the airport) which marked the last major uphill on the way back, I knew I only had about a mile left and could make it back. After turning off the Huck there was a gradual 1/4 mile climb to Airport Rd. and the elementary school that seemed like it was forever. I gave one look over my should to make sure no one was making sprint for the line and jogged the rest of the way in. I can't say I was super pleased with how I ran. I didn't feel great. I felt like I lacked energy and had a negative attitude for most of the run but somehow managed to just barely miss a PR. One thing that was different was that this was the first time I had run hard without having a beard. After I crossed the finish line and met up with Michelle, I told her I couldn't feel my face...it really was that cold. I managed to finish 9/22 for my age group and 45/181 with a time of 1:14:42. I did most post race hands on my knees "I feel awful" dance for a little while and headed inside for warmth and to find post race food. Michelle was nice enough to make hot chocolate before we left which gave us an excuse to try out the new Stanley thermos I received for Christmas. Michelle also had cookies waiting for me when I finished...in an attempt to avoid any hangry situations. After a brownie and a a few cookies we decided it was time to head home. It was a humbling first run of the year. I am sure we'll be back next year...maybe I'll even convince Michelle to do the 5k? ...maybe I'll join her. 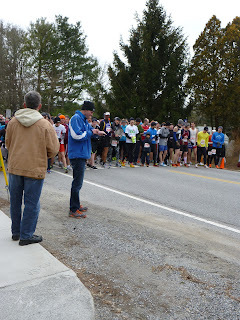 Posted by Unknown at 1:18 PM , Links to this post , 0 comments I'm reading from MyDailyGround: The Blacksburg Classic (10 Miler) Race Report Tweet this! Well...I have already disappointed on my two "goals" of January which were to 1) blog two additional times, specifically about the time Michelle and I spent in the Outer Banks over the new year and 2) my projected race schedule for 2013. The second one I have no excuse for because I already had most of the post written, I just needed to tweak a few things and post it. Better late than never I suppose. So here it is...the moment all two of you (Thanks for reading Dad and Michelle!) have been waiting for! 1/13/13 - Atlanta Hot Chocolate Run 15K Initially, when I wrote this post the Hot Chocolate 5K was in the projected schedule for 2013, but as we solidified our plans for the holidays this race was the first to meet the chopping block. Probably because it was a little over 6 hours away and required a hotel, but also it was the only race we had planned for the holidays/break. It's still high on my list of runs to do, eventually. I mean they give out hoodies instead of race shirts AND the post race food is supposed to be AWESOME! Lets be honest, the food is really the whole reason I want to do the run! The Hot Chocolate series is in a bunch of cities including Chicago, which is somewhere I've always wanted to visit, so maybe we'll put it on the calendar next year! 2/16/13 - Blacksburg Classic - Completed! My first race of the season and it was humbling. Look for a full report sometime this week (or next month based on my recent reliability)! 3/16/13 - Rock 'n' Roll USAMarathon - Completed! 4/13/13 - The 3.2 Run in Remembrance (Free!) - Registered! Michelle and I will be running this one together. This one is dear to our hearts and is important to complete together, as a team! The Duke Energy Stair Climb is a little different than anything I have ever attempted. I view it as a stepping stone to my real goal of eventually completing the Empire State Building Run Up! Still up in the air between these two races. I believe I have now passed the cost of the registration fees listed below but I'm too lazy to look them up, yes I know I linked them right below but that would require me being interested in going to look. I just know (believe) they're currently more now then when I wrote this. **Updated 3/19/2013** I seem to get a little "registration crazy" after a big race, in this case the Rock 'n' Roll USA (DC) Marathon. The idea of stepping up to the 50 miler has been discussed for some time now so I finally decided to act on it and register. 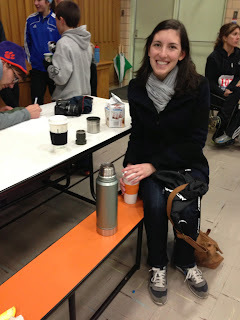 6/1/13 - North Face Endurance Challenge - Washington, D.C. - 50 Miler - Registered! 6/21/13 - Downtown Sundown 5K - This run is put on by Run About Sports for the downtown Blacksburg Summer Solstice Fest and hence the run starts at 8:30PM. This wouldn't happen if I decided to run the Eastern Divide Ultra (Giles County above) but would work well with the North Face Endurance Challenge! This is a big marathon month so it would be tough NOT to do something or find a race to build up to either of the races I have listed for November. A half may fit in well here but I'm also tempted to consider running (or attempting to) two marathons in the span of one month, not a calendar month but in a four week period just to see how my body would hold up. Further, if I ever intend to complete the 50 State Marathon Challenge I will have to learn how to accomplish the above mentioned. So there you have it! My 2013 race calendar laid out...nice and solidified! Right. The nice thing about now have too many "big" races is the flexibility to do smaller, fun, local runs in the New River Valley Area! I'm sure I will run some races that are not listed above and not run some that I have mentioned. For example, the Lynchburg 10 miler could be a possibility this year, especially after I had such a blast racing it for free last year! If anyone has a race they would be interested in doing together let me know, I'm always up for something new! Posted by Unknown at 7:44 PM , Links to this post , 0 comments I'm reading from MyDailyGround: 2013 Race Schedule Tweet this!